For the past month or so I’ve been working on a little side project that I’ve dubbed “Project Excelsior.” I’ve not had an abundance of time to spend on it over the past few week, so I’m just now wringing out some of the technology stack. 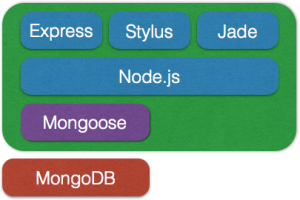 I’ve almost decided completely on the MEAN stack. I’m close enough to a final decision that I’ve started prototyping the server side. I’ve not worked with angular before, but I am familiar with ember and backbone.